El-Amin, S.F., et al. Anterior Cruciate Ligament Tissue Engineering: A Review of Current Investigations. (2016) J Nanotech Mater Sci 3(1): 3-9. © 2016 El-Amin, S.F. This is an Open access article distributed under the terms of Creative Commons Attribution 4.0 International License. The anterior cruciate ligament (ACL) is the most commonly injured ligament of the knee. The incidence of rupture is reported to be 1/3000, and approximately 100,000 reconstructive surgeries are performed annually in the United States. Reconstruction of the anterior cruciate ligament aims to restore mechanical stability to the knee joint and impede formation of osteoarthritis and other degenerative joint issues. Due to the limitations in long term stability and comorbidities associated with current available graft options, the possibility of utilizing tissue engineering to aid in the healing of the anterior cruciate ligament has gained significant attention. The goal of tissue engineering is to develop a degradable scaffold that provides sufficient initial strength and stability to the knee joint to support normal functioning post-implantation, while allowing cells and growth factor infiltration for remodeling and eventual restoration of the ACL. The investigation into the possibility of a tissue engineered ACL graft is still in its early stages. The search for an ideal scaffold construct and cell source continues to be a challenge. However, earlier studies show promise and future investigations are sure to bring us closer to in vivo implementation and utilization of an appropriately engineered ACL graft with the structural integrity comparable to the native ACL. The anterior cruciate ligament (ACL) is the most commonly injured ligament of the knee. The incidence of rupture is reported to be 1/3000, and approximately 100,000 reconstructive surgeries are performed annually in the United States[1-5]. Injury occurs when an excessive tension force is applied to the ligament, commonly due to abrupt twisting and/or deceleration movements performed on a planted foot[6-8]. The ACL plays a principal role in providing mechanical stability to the knee joint. Originating on the posterior-medial aspect of the lateral femoral condyle, the ACL attaches distally to the proximal tibia. It is made up of several components including types I, III, and V collagen, elastin, proteoglycans, water, and cells-mostly fibroblasts; these combine in an hierarchical fashion to create a dense, highly organized, cable-like tissue[9,10]. The ACL functions to prevent anterior and medial translocation of the tibia on the femur, and to provide constraints on the rotational capabilities of the knee joint. Kinematic importance of the ACL is highlighted by the fact that, upon injury, there is immediate mechanical limitation of the knee, followed by a predisposition to arthritis and meniscal injuries[12,13]. The most sensitive clinical test to acutely diagnose ACL instability is the Lachman test, performed by stabilizing the femur and applying anterior force to the tibia while the knee is held in 20 - 30 degrees of flexion. Injury to the ligament results in either a soft endpoint or increased anterior translation of the tibia. Normal ligament healing proceeds through three distinct stages. The initial 72 hours are marked by inflammation with accumulation of serous fluid and hematoma formation. The recruited inflammatory cells release growth factors, chemokines and cytokines. Vasodilation occurs and mast cells degranulate. During this stage, phagocytic cells rid the area of necrotic tissue and debris, angiogenesis takes place and fibroblasts are attracted to the area of injury[16-18]. This is followed by cellular proliferation and matrix production. Finally, approximately 6 weeks after the initial injury, remodeling begins and will eventually yield a slightly disorganized extracellular matrix[19,20]. Unfortunately, other anatomical structures and poor vascularization preclude the ACL from being able to undergo complete self-repair[21-23]. Due to its intra-articular location, rupture of the ACL also tears its thin synovial sheath, allowing blood to escape the site of injury, and thus impeding the formation of a hematoma. Without the development of this provisional scaffold, the necessary milieu for repair is not created and healing cannot proceed. Conservative management of ACL injuries may be attempted for patients who are less active or unable to modify current activities. However, recurrent episodes of instability are usually experienced, especially with pivoting activities, and in most cases reconstruction will be necessary. Reconstruction of the ACL aims to restore mechanical stability to the knee joint and impede formation of osteoarthritis and other degenerative joint issues. Primary repair of ACL tears has been shown to result in failure over time, and reconstruction with various grafts is considered to be the current standard of care[24,25]. Current options for graft replacement include autografts, allografts, and synthetic polymer grafts. Several types of autografts are commonly used for ACL reconstructions, including Bone-Patellar Tendon-Bone (BPTB), four-strand hamstring and quadriceps tendon. A recent meta-analysis revealed central third Patellar Tendon (PT) autografts tend to have decreased failure rates, decreased postoperative joint laxity, and increased patient satisfaction rates when compared to hamstring tendon autografts. Cooper et al showed Bone-Patellar Tendon-Bone (BPTB) autografts have mechanical properties greater than or equal to that of the native ACL. Though it continues to yield positive functional results, BPTB autograft is not without limitations, largely due to donor-site morbidity. Recognized disadvantages of this graft include patellofemoral pain/crepitus, weakness of the quadriceps muscle, loss of joint motion, kneeling pain, patellar tendon rupture, and patellar fracture[30-32]. An option that avoids the disadvantages associated with using autograft would be an allograft, usually acquired from cadaveric patellar, hamstring or achilles tendons. A recent comparison of outcomes after Achilles Tendon (AT) allograft versus BPTB autograft demonstrated marginally greater laxity in allograft patients. However, knee range of motion was shown to be better and with significantly less pain in the allograft study group. Major concerns associated with this form of ACL reconstruction include disease transmission, bacterial infection and immunologic complications[33,34]. One of the biggest fears related to this is the possibility of transmission of HIV, even with strict multiphasic donor screening and serologic testing, the risk of HIV transmission by bone allograft is estimated to be a mereless than 1/1,000,000. The lack of screening for prion infections has also raised concerns due to a reported development of Creutzfeldt-Jakob disease attributed to a contaminated allograft dural graft transplant. Synthetic grafts have also been found to cause problems due to material degradation, wear debris, foreign-body inflammation and synovitis. The mechanical effect is that the graft has appropriate initial strength,but is frequently followed by rupture and failure. 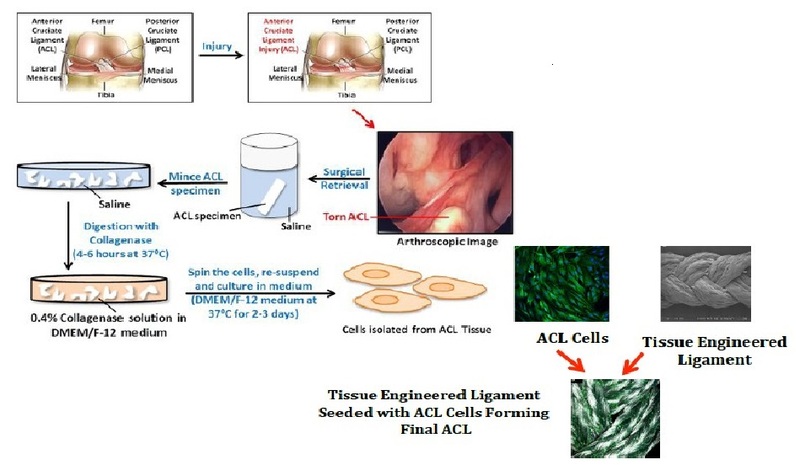 Due to the limitations in long-term stability and comorbidities associated with the aforementioned graft options, the possibility of utilizing tissue engineering approach to aid in the healing of the native ACL has gained significant attention. As mentioned previously, one of the reasons for ACL replacement is due to the poor ability of the native ligament to heal itself. It is hoped that engineered tissue will serve an important role, bridging the gap caused by ligamentous rupture, while providing a migration site for cells and growth factors. The goal of tissue engineering is to develop a degradable scaffold that provides sufficient initial strength and stability to the knee joint to support normal functioning post-implantation, while allowing cell and growth factors infiltration for remodeling and eventual restoration of the ACL. Ideally, the degradation rate of the implant would match the infiltration rate of neoligament formation, and eventually the scaffold would be completely replaced by regenerated ligament cells and matrix[26,37]. As this occurs, the mechanical load would slowly be transferred from the implanted scaffold to the newly formed ligamentous tissue. In theory, this would result in the generation of an ACL that is very similar to the slightly disorganized matrix observed after ligament self-repair and is able to function similar identically to the native ACL. Characteristic features for a successful scaffold material are biocompatibility, strength, allowance of tissue in growth, and degradation rate. One commonly studied polymer is poly (L-lactide). It has been shown to have excellent biocompatibility through in vivo studies. However, its crystalline nature imparts poor compliance,which makes it unsuitable for use as a scaffold to endure dynamic loading[39-41]. In an attempt to compensate for the brittle nature of this synthetic polymer, copolymerization with other known biodegradable monomers was examined. A recent study evaluated the mechanical properties and cellular infiltration of poly (L-lactide-co-glycolide), poly (L-lactide-co-D, L-lactide), poly (D, L-lactide), and poly (L-lactide). It was found that the crimp pattern imparted on the scaffolds demonstrated a similar crimp-unfolding strain to that of native ACL. The authors further hypothesized that it is this mimicry of native ligament microstructure that causes seeded fibroblasts to become biologically active, thus leading to the observation that collagen and GAG synthesis increased significantly beyond week three of the study. However, after cellular infiltration of these synthetic polymers, the constructs were mechanically unsuitable for in vivo characterization due to low load and modulus in comparison to native ACL. Another comparison study that looked at in vitro performance of poly(desaminotyrosyl-tyrosine dodecyl dodecanedioate), p(DTD DD), and Poly-L-Lactic Acid (PLLA), found that PLLA possessed greater strength and lower modulus during the initial follow up period and upto 64 weeks. No difference in fibroblast attachment or proliferation was detected between the two scaffolds. However, when results were compared to a study performed using a collagen scaffold, collagen appeared to El-Amin, be better suited for fibroblast infiltration, but lacked comparable strength. In light of these observations, a more recent study explored the possibility of constructing a hybrid scaffold composed of p(DTD DD) and collagen, with the hopes of combining the initial strength and resorption profile of the former and the tissue ingrowth of the latter. Implanted sheepwere able to bear weight 36 hours following the procedure, and return to normal activity was seen after 40 days of implant. Additionally, cellular infiltration increased over time, demonstrating the potential for adequate tissue ingrowth. However, during arthroscopic evaluation at 12 weeks, the braided hybrid scaffolds were no longer as tense as seen post-implantation. Despite these promising results, complications related to byproducts of degradation continue to present major concerns with the use of synthetic polymer scaffolds. For example, PLLA byproducts pose the threat of altering the intraarticular pH, inducing bone resorption and generating debris for up to eight years after implantation[45-47]. For these reasons, among others, the possibility of using natural materials to construct a scaffold is also being explored. Silk, produced by the Bombyxmori silkworm, has been investigated as a possible ligament scaffold with promising results. Recent studies have shown silk matrices have initial tensile properties significantly higher than native ACLs. This is important for the scaffold to adequately compensate for the loss of strength that occurs as resorption and replacement by tissue ingrowth take place. Furthermore, cellular infiltration and production of collagen-I and III, were observed after incubation with adult human progenitor bone marrow stromal cells. It was also seen that stiffness of the hydrophilic silk was within a range that provides stability to the knee without stress shielding the infiltrating tissue. Biocompatibility of the silk protein was shown to be adequate as revealed by absence of cytotoxicity[49,50]. Type I collagen has also been a popular choice for tissue engineering approaches due to its biocompatibility and ability to induce neoligament formation[44,51]. 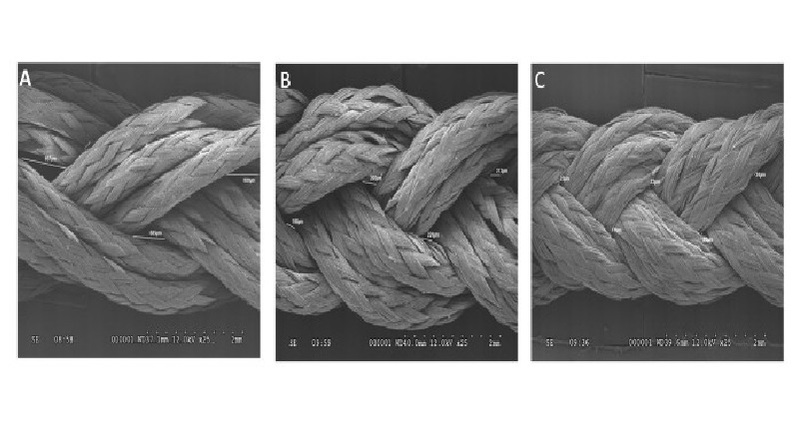 A study using acid-soluble type I collagen from the tendon of Sprague -Dawley rat tails arranged the fibers into a novel crosslinked, braid-twist scaffold in an attempt to improve initial strength of the scaffold. Mechanical testing showed improved uniaxial tensile tests and Young’s modulus compared to controls without crosslinks. When considering the standard deviation of Young’s modulus, the ultimate tensile strength of the braid-twist scaffold showed overlap with that of human ACL. The scaffold also demonstrated similar trends in stress-relaxation tests compared to the native ACL. This was supported by another study examining the mechanical properties of the braid-twist design with synthetic PLLA that also found improved tensile strength, ultimate strain and length of the toe region of the stress-strain curve. Therefore, it would seem that the braid-twist model improves strength of the scaffold regardless of the material chosen to form the matrix. In addition to developing a scaffold construct that provides initial stability, while also allowing for cellular infiltration and eventual replacement, an appropriate cell source must be identified that will infiltrate the scaffold and produce a matrix rich in collagen for structural integrity to the host ACL. One possibility that has been under investigation is the use of ACL fibroblasts. In a study by Brune et al, fibroblasts from intact ACLs were compared to ruptured ACLs. They found both cells were capable of attaching to and proliferating onto the porcine small intestinal submucosa extracellular matrix (SIS-ECM). Histological examination revealed a pattern similar to native ACL in both groups, and cellular constructs were longitudinally organized collagenous tissues after two to three weeks. Interestingly, RT-PCR and immunohistochemical staining revealed that fibroblasts from intact and ruptured ACL had similar expression of collagen type I. However, once seeded on the cellular construct those from the ruptured ligament demonstrated a significant increase in production of type I collagen. Based on this data, it was concluded that human ACL cells are a potential source for use in future tissue engineering applications. Although the use of ACL cells would be ideal, accessing them is difficult due to their intrasynovial location. A comparison of fibroblasts derived from the ACL, Medial Collateral Ligament (MCL), AT and PT seeded on 3-D fibrous PLLA scaffolds was performed in an attempt to identify easily accessible alternatives to the use of ACL cells. It was found that all four cell types had higher proliferation on tissue culture polystyrene when compared to the 3-D scaffold. The tendon fibroblasts proliferated faster than ligament fibroblasts, regardless of the material used and composition of the culture medium. RT-PCR analysis was performed on fibronectin, type I collagen and type III collagen. ACL fibroblasts were observed to have significantly greater gene expression than MCL and PT in all three groups. When compared to AT, the difference in production of type I collagen was not significant. This is likely due to the upregulation of type III collagen during ligamentous healing, which is enhanced by the braided scaffold. Based on these findings, the authors concluded that proliferation and collagen production should not be the primary criteria, but that differentiation is equally as important and could hold more promise as a determining factor for cell source. The search for an optimal cell source has also led to investigation into the use of fibroblasts derived from other tissues, such as skin. The advantage of skin as a cell course is the accessibility for harvesting. 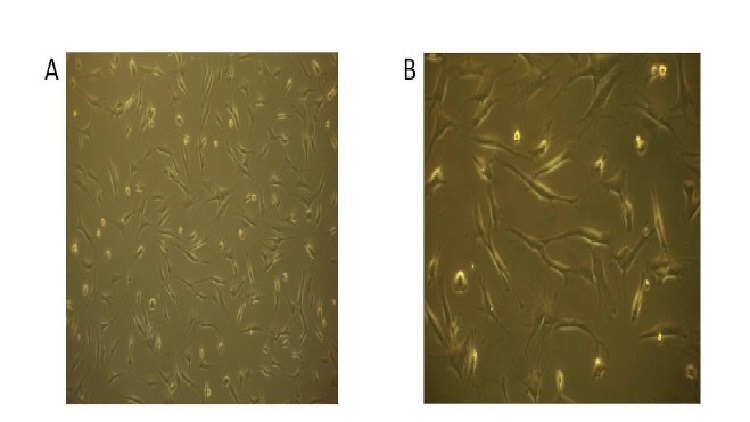 In a comparison of goat skin fibroblasts and ACL fibroblasts seeded onto a collagenous construct, the newly formed matrices were oriented properly and no difference was observed between the cell types. Both cell types showed neovascularization and nerve generation. The investigation into the use of Bone Marrow Stem Cells (BMSCs) as a cell source is also underway. A recent study showed ACL cells and skin fibroblasts all successfully proliferate and attach to the scaffold along the longitudinal axis. Matrix production and collagen formation occurred after 6-12 days along the periphery. Central penetration of the scaffold was limited to areas where the microstructure was more porous, highlighting the importance of scaffold design. Proliferation, as determined by DNA content, and overall collagen production were noted to be highest for the bone marrow stromal cells. However, collagen production per microgram of DNA did not show a significant difference between skin fibroblasts and the BMSC. Of note, the authors did mention that these results may not be generalizable, as all the cells were harvested from a single donor. Another comparative study examined the proliferation, matrix production, and in vivo survivability of rabbit bone marrow stromal cells and anterior cruciate ligament fibroblasts (ACLF). The BMSC were noted to have increased proliferation and GAG production compared to the ACL fibroblasts after seeding onto the silk scaffold construct. The transcript level of type I collagen, type III collagen and tenascin-C in the ACLF remained fairly constant throughout the culture period and was significantly higher than that for BMSC at seven days. However, the rate of production increased after a week in the bone marrow cells. Histologic evaluation revealed that BMSC seeded constructs had a higher cell density and produced a continuous ECM with an increased concentration of type I collagen, type III collagen and tenascin–C when compared to the ACLF after two weeks of culture. Implantation of the cell-seeded constructs revealed that both cell types survived for the four weeks of the experiment, but BMSC demonstrated higher in vivo cell viability when the cells were transfected with Green Fluorescent Protein (GFP). Because the BMSC showed greater proliferation in vitro, it cannot be determined whether this is due to increased survivability in vivo or related to the increased proliferation. The acquisition of BMSCs is a fairly invasive and painful procedure. Therefore, the search for an easily accessible source has further led to the investigation of human adipose-derived stem cells. One study examined the potential of adipocytes from liposuction and found treatment with multiple growth factors that are known to stimulate ligament gene expression did not prove to be promising. Treatment with IGF-1, TGFB1, EGF, and bFGF did not significantly effect gene expression. Therefore, further investigation is needed to reveal an appropriate adipose- derived cell source. The human anterior cruciate ligament is a major stabilizer of the knee joint. It is also the most commonly injured ligament of the knee. Due to its anatomic location, the ACL is incapable of self-repair and requires surgical management in most instances of rupture. Multiple options for reconstruction are available, the most common being allograft or autograft. Regardless of the graft source chosen, it is difficult to recreate the kinematic function of the ACL tissue engineering aims to prevent many of the disadvantages seen with other reconstruction options. By mimicking the function of hematoma formation, the cell seeded scaffold aims to guide the self-repair of the ligament. In order to be successful, the scaffold must be biocompatible, strong, a suitable environment for tissue ingrowth, and have a degradation rate that mirrors the infiltration rate of neoligament formation. Studies have explored the possibility of using collagen and various synthetic polymers to develop an appropriate scaffold. Early results have demonstrated that synthetic polymers have a more desirable strength profile, whereas collagen is better suited for cellular infiltration and proliferation. Studies have also been performed on scaffolds created from a combination of synthetic polymer and collagen. It has been observed that this results in a matrix with strength and tissue ingrowth that is comparable to the native ACL. Silk, a natural polymer with more strength than collagen has also shown promising results as a possible scaffold material. Finally, cell source is another important factor to consider when developing a construct. 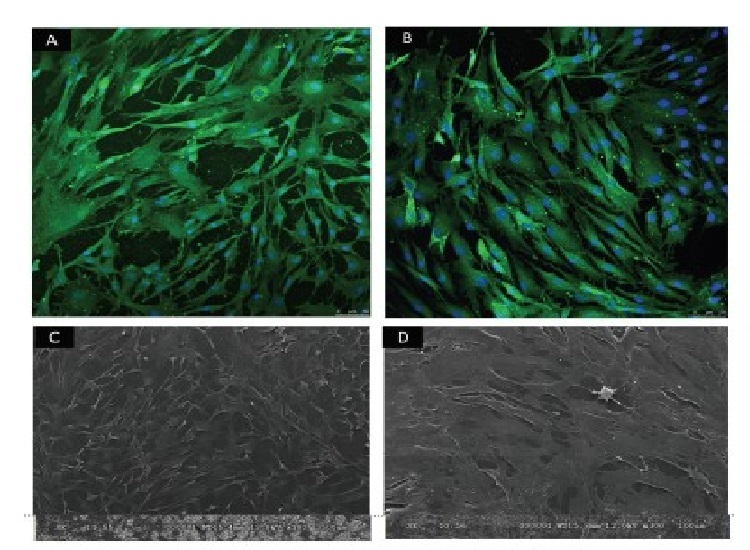 ACL fibroblasts, although theoretically an ideal source, are difficult to harvest and have slower growth rates than BMSC and fibroblasts derived from other sources. However, whether other cell sources can mimic native ACL cells in form and function is still unclear. The investigation into the possibility of a tissue engineered ACL graft is still in its early stages. The search for an ideal scaffold construct and cell source continues to be a challenge. However, early studies show promise and future investigations are sure to bring us closer to in vivo implementation and utilization of an appropriate tissue engineered ACL graft with the structural integrity required to compare to the native ACL. To address the issues with currently available options, our laboratory is undergoing investigations to identify a potential cell source for utilization in the development of a tissue engineered patch that could be implemented in the repair of a partially torn ACL. A novel protocol has been developed for the expansion of cells derived from patients undergoing ACL reconstruction. To isolate the cells, minced hACL tissue obtained during ACL reconstruction was digested in a collagenase solution. Early results show spindle- or elongated-shaped human ACL derived cells will grow on the surface of Tissue Culture Polystyrene (TCPS) plates after 3 days of culture and 7 days post-isolation (Figure 1). Additionally, the hACL derived cells adhere, grow and retain morphology on the surface of tissue engineered poly lactic-co-glycolic acid scaffolds (Figure 2). This technique is promising for applications in partial ACL regeneration and reconstruction. In addition, to address the concerns of mechanical strength of the ACL, a novel braiding technique has been developed in our lab, which addresses previous concerns associated with ligaments based on polyesters (Figure 3 and 4). The entire process is summarized in a comprehensive schematic of the tissue engineered ACL, with promising preliminary results (Figure 5). Finally, this process has been culminated by the development of non-degradable ACL technology based on hydrogel technology that creates a ligament that resembles a bone tendon bone interface that can be used in a revision ACL scenario (Figure 6). Figure 1: Human ACL cell growth/ days post- isolation from adult ACL tissue observed under a light microscope at (A) 10X and B 20X magnification. Figure 2: Confocal imaging (10X magnification and 3.1 zoom) of human ACL cells grown in culture on (A) PLAGA disks and on (B) TCPS disks at three days post seeding. SEM imaging (100X magnifications) of human ACL cells grown in culture on (C) PLAGA disks and (D) TCPS disks at three days post seeding. Figure 3: SEM imaging of a tissue engineered ACL scaffold at 25X magnification showed (A) the 2 turns/ inch scaffold construct with an average pore size of 696 μm, (B) the 4 turns/inch scaffolds with an average pore size of 232.25 μm, and (C) the 6 turns/inch scaffolds with an average pore size measured at 25 μm. 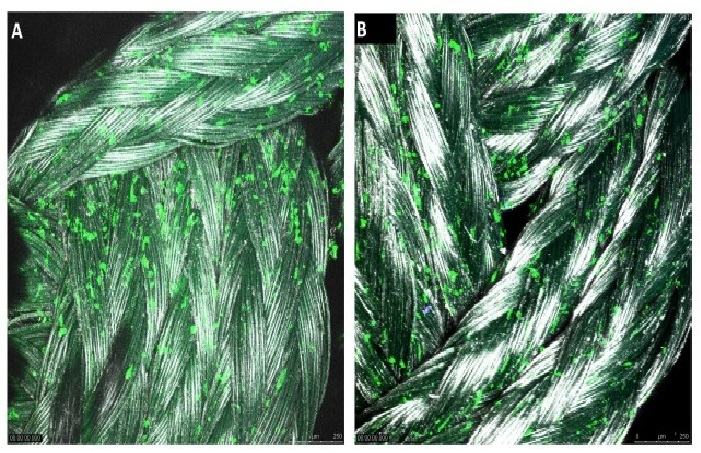 Figure 4: Confocal imaging (10X magnification and 3.1 zoom) of human ACL cells grown on the (A) 4-braid PLAGA constructs, and the (B) 6-braid PLAGA tissue engineered ACL construct at 3 days post seeding. Figure 5: Comprehensive Schematic of tissue engineered ACL, showing the complete process of ACL extraction to degradation, after isolation from hACL cells. Steps involved in the surgical retrieval, tissue digestion and isolation of cells from injured Anterior Cruciate Ligament (ACL) for Tissue engineering applications. During the ACL reconstruction surgery, the remaining (surgical waste) ACL stump is collected and stored in saline. The collected ACL stump is minced into 1--2mm³ pieces and washed with saline. The minced ACL is digested with 0.4% Collagenase solution in DMEM/F--12 medium. The cells are then centrifuged, resuspended and cultured in DMEM/F--12 medium at 37°C. Once grown, ACL cells are implanted to form the new tissue engineered ligament. 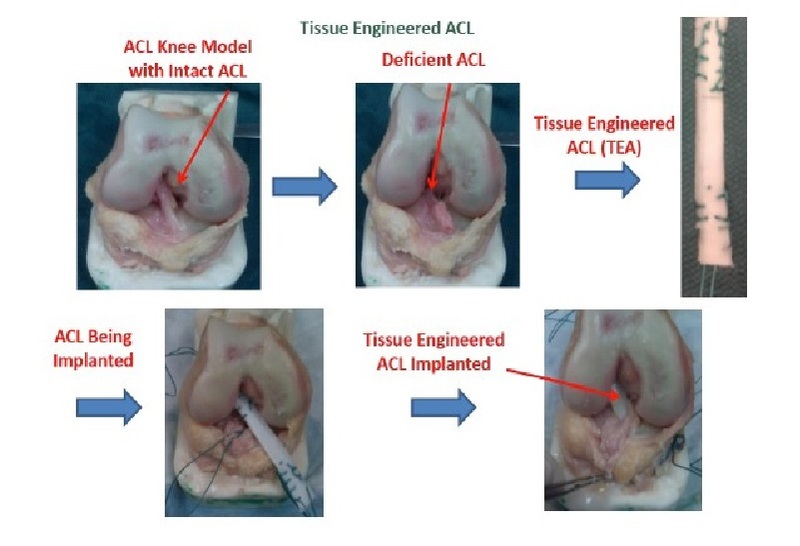 Figure 6 : Tissue Engineered ACL – ACL knee model reflecting a deficient ACL replaced by an implanted ACL engineered from synthetic hydrogel based ACL reconstruction. The investigation into the possibility of a tissue engineered ACL graft is still in its early stages. The search for an ideal scaffold construct and cell source continues to be a challenge. However, early studies show promise and future investigations are sure to bring us closer to in vivo implementation and utilization of an appropriate tissue engineered ACL graft with the structural integrity required to compare to the native ACL. Acknowledgement: The authors would like to acknowledge Ashim Gupta, Kevin Sharif, Mia, D. Woods and Anish, G. Potty for their contributions to this work. 1. Johnson, R.J. The anterior cruciate ligament: A dilemma in sports medicine. (1982) Int J Sports Med 3: 71-79. 2. Owings, M.F., Kozak, L.F. Ambulatory and inpatient procedures in the United States, 1996. ( 1998) Vital Health Stats 13(139): 1-119. 3. Gordon, M.D., Steiner, M.E. Orthopaedic knowledge update: Sports medicine. In: Garrick, J.G., editor. Orthopaedic Knowledge Update: Sports Medicine. (2004) American Academy of Orthopaedic Surgeons: Rosemont, Illinois 169-181. 4. Frank, C.B., Jackson, D.W. The science of reconstruction of the anterior cruciate ligament. (1997) J Bone Joint Surg Am 79(10): 1556-1576. 5. Miyasaka, K.C., Daniel, D.M., Stone, M.L., et al. Hirshman P. (1991) The incidence of knee ligament injuries in the general population. Am J Knee Surg 4: 3-8. 6. Yu, Bing., Garret, W.E. Mechanisms of non-contact ACL injuries. (2007) Br J Sports Med 41(Suppl I): i47-i51. 7. Arendt, E.A., Grossfeld, S.L. Patient selection for ACL reconstruction. (1996) Sports Med Arthro Rev 4: 328-335. 8. Howell, S.M., Taylor, M.a. Brace-free rehabilitation with early return to activity for knees reconstructed with a double-looped semitendinosus and gracilis graft. (1996) J Bone and Joint Surg Am 78(6): 814-825. 9. Dutho, V.M., Barea, C., Abrassart, S., et al. Anatomy of the anterior cruciate ligament. (2006) Knee Surg Sports Traumatol Arthrosc 14(3): 204-213. 10. Woo, S.L., Abramowitch, S.D., Kilger, R., et al. Biomechanics of knee ligaments: injury, healing, and repair. (2006) J Biomech 39(1):1–20. 11. Van de Velde, S.K., Gill, T.J., Li, G. Evaluation of kinematics of anterior cruciate ligament-deficient knees with use of advanced imaging techniques, three-dimensional modeling techniques, and robotics. (2009) J Bone and Joint Surg 91(1): 108-114. 12. Liden, M., Sernert, T., Rostgard-Christensen, L., et al. Osteoarthritic changes after anterior cruciate ligament reconstruction using bone-patellar tendon-bone or hamstring tendon autografts: a retrospective, 7-year radio graphic and clinical follow-up study. (2008) Arthroscopy 24(8): 899-908. 13. Kessler, M.A., Behrend, H., Henz, S., et al. Function, osteoarthritis activity after ACL-rupture: 11 years follow-up results of conservative versus reconstructive treatment. (2008) Knee Surg Sports Traumatol Arthrosc 16(5): 442-448. 14. M.L., Mizuno, Y., Cosgarea, A.J. Diagnosing and managing anterior cruciate ligament injuries. (2000) J of Musculoskel Med 17: 47-53. 15. Laurencin, C.T., Freeman, J.W. Ligament tissue engineering: An evolutionary materials science approach. (2005) Biomaterials 26(36): 7530-7536. 16. Lin, T.W., Cardenas, L., Soslowsky, L.J. Biomechanics of tendon injury and repair. (2004) J Biomech 37(6): 865–877. 17. Fenwick, S.A., Hazleman, B.L., Riley, G.P. The vasculature and its role in the damaged and healing tendon. (2002) Arthritis Res 4(4): 252–260. 18. Gelberman, R.H., Chu, C.R., Williams, C.S., et al. Angiogenesis in healing autogenous flexor-tendon grafts. (1992) J Bone Joint Surg Am 74(8): 1207–1216. 19. Silver, F.H. Biomaterials, medical devices and tissue engineering: an integrated approach. (1994) London: Chapman and Hall 92-119. 20. Frank, C., Woo, S.L., Amiel, D., et al. Medial collateral ligament healing. a multidisciplinary assessment in rabbits. (1983) Am J Sports Med 11(6): 379-389. 21. Murray, M.M., Martin, S.D., Martin, T.L., et al. Histological changes in the human anterior cruciate ligament after rupture. (2000) J Bone Joint Surg Am 82(10): 1387-1397. 22. Bray, R.C., Leonard, C.A., Salo, P.T. Vascular physiology and long-term healing of partial ligament tears. (2002) J Orthop Res 20(5): 984-989. 23. Peterson, W., Tillman, B. Structure and vascularization of the cruciate ligaments of the human knee joint. (1999) Anat Embryol (Berl) 200(3): 325-334. 24. Oensten, M., Lysholdm, J., Gillquist, J. Suture of fresh ruptures of the anterior cruciate ligament. A 5 year follow up. (1984) Acta Orthop Scand 55(3): 270-272. 25. Poehling, G.G., Curl, W.W., Lee, C.A., et al. Analysis of outcomes of anterior cruciate ligament repair with 5-year follow-up: Allograft versus autograft. (2005) Arthroscopy 21(7): 774-785. 26. Johnson, R.J., Beynnon, B.D., Nichols, C.E. The treatment of injuries of the anterior cruciate ligament [current concepts review]. (1992) J Bone Joint Surg am 74(1): 140-151. 27. Freedman, K.B., D’Amato, M.J., Nedeff, D.D., et al. Arthroscopic anterior cruciate ligament reconstruction: A metaanalysis comparing patellar tendon and hamstring tendon autografts. (2003) Am J Sports Med 31(1): 2-11. 28. Cooper, D.E., Deng, X.H., Burstein, A.L., et al. The strength of the central third patellar tendon graft. A biomechanical study. (1993) Am J Sports Med 21(6): 818-823. 29. Hospodar, S.J., Miller, M.D. Controversies in ACL reconstruction: Bone-patellar tendon-bone anterior cruciate ligament reconstruction remains the gold standard. (2009) Sports Med Arthrosc 17(4): 242-246. 30. Sachs, R.A., Daniel, D.M., Stone, M.L., et al. Patellofemoral problems after anterior cruciate ligament reconstruction. (1999) Am J Sports Med 17(6):760-765. 31. Rosenberg, T.D., Franklin, J.L., Baldwin, G.N., Nelson, K.A. Extensor mechanism function after patellar tendon graft harvest for anterior cruciate ligament reconstruction. (1992) Am J Sports Med 20(5): 519-525. 32. Simonian, P.T., Mann, F.A., Mandt, P.R. Indirect forces and patellar fracture after anterior cruciate ligament reconstruction with patellar ligament. Case report. (1995) Am J Knee Surg 8(2): 60-64. 33. Rapp, S.M. Postsurgical infection and septic arthritis traced to allograft tissue. (2002) Orthop Today 22: 4. 34. Pinkowski, J.L., Reiman, P.R., Chen, S.L. Human lymphocyte reaction to freeze-dried allograft and xenograft ligamentous tissue. (1989) Am J Sports Med 17(5): 595-600. 35. Buck, B.E., Malinin, T., Brown, M.D. Bone transplantation and HIV: An estimate of risk of acquired immunodeficiency syndrome. (1989) Clin Orthop Relat Res 240(240): 129-136. 36. Martinez-Lage, J.F., Poza, M., Sola, J., et al. Accidental transmission of Creutsfeldt-Jakob disease by dural cadaveric grafts. (1994) J NeurolNeurosurg Psychiatry 57(9): 1091-1094. 37. Tovar, N., Bourke, S., Jaffe, M., et al. A comparison of degradable synthetic polymer fibers for anterior cruciate ligament reconstruction. (2010) Journal of Biomedical Materials Research A 93(2): 738-747. 38. Vavken, P. Tissue engineering of ligaments and tendons. (2009) Fundamentals of Tissue Engineering and Regenerative Medicine Chapter 24: 317-327. 39. Jeong, S.I., Kim, B.S., Kang, S.W., et al. In vivo biocompatibility and degradation behavior of elastic poly(L-lactide-co-E-caprolactone) scaffolds. (2004) Biomaterials 25(28): 5939-5946. 40. Durselen, L., Dauner, M., Hierlemann, H., et al. Resorbable polymer fibers for ligament augmentation. (2001) J Biomed Mater Res 58(6): 666-672. 41. Shalaby, S.W. High strength fibres of L-lactide copolymers, epsilon-caprolactone and trimethylene carbonate and absorbable medical constructs therof, US patent 6342065. (2002). 42. Surrao, D.C., Waldman, S.D., Amsden, B.G. Biomimetic poly(lactide) based fibrous scaffolds for ligament tissue engineering. (2012) Acts Biomaterials 8(11): 3997-4006. 43. Caruso, A.B., Dunn, M.G. Changes in mechanical properties and cellularity during long-term culture of collagen fiber ACL reconstruction scaffolds. (2005) J Biomed Mater Res A 73(4): 388-397. 44. Tovar, N., Murthy, N.S., Kohn, J., et al. ACL reconstruction using a novel hybrid scaffold composed of polyarylate fibers and collagen fibers. (2012) Journal of Biomedical Materials Research Part A 100(11): 2913-2920. 45. Taylor, M.S., Daniels, A.U., Andriano, K.P., et al. Six bioabsorbable polymers: In vitro acute toxicity of accumulated degradation products. (1994) J Appl Biomater 5(2):151-157. 46. Matsusue, Y., Hanafusa, S., Yamamuro, T., et al. Tissue reaction of bioabsorbable ultra high strength poly (L-lactide) rod. A long-term study in rabbits. (1995) Clinical Orthopaedic Related Research 317: 246-253. 47. Daniels, A.U., Chang, M.K., Andriano, K.P. Mechanical properties of biodegradable polymers and composites proposed for internal fixation of bone. (1990) J Appl Biomater 1(1): 57-78. 48. Altman, G.H., Diaz, F., Jakuba, C., et al. Silk-based biomaterials. (2003) Biomaterials 24(3): 401-416. 49. Horan, R.L., Toponarski, I., Boepple, H.E., et al. Design and characterization of a scaffold for anterior cruciate ligament engineering. (2009) The Journal of Knee Surgery 22(1): 82-92. 50. Altman, G.H., Horan, R.L., Lu, H.H., et al. Silk matrix for tissue engineered anterior cruciate ligaments. (2002) Biomaterials 23(20): 4131-4141. 51. Walters, V.I., Kwansa, A.L., Freeman, J.W. Design and analysis of braid-twist collagen scaffolds. (2012) Connective Tissue Research 53(3): 255-266. 52. Freeman, J.W., Woods, M.D., Laurencin, C.T. Tissue engineering of the anterior cruciate ligament using a braid-twist scaffold design. (2007) J of Biomechanics 40(9): 2029-2036. 53. Eagan, M.J., Zuk, P.A., Zhao, K.W., et al. The suitability of human adipose-derived stem cells for the engineering of ligament tissue. (2012) J Tissue Eng Regen Med 6(9): 702-709. 54. Brune, T., Borel, A., Gilbert, T.W., et al. In vitro comparison of human fibroblasts from intact and ruptured ACL for use in tissue engineering. (2007) European Cells and Materials 14: 78-91. 55. Cooper, J.A., Jr, Bailey, L.O., Carter, J.N., et al. Evaluation of the anterior cruciate ligament, medial collateral ligament, achilles tendon and patellar tendon as cell sources for tissue-engineered ligament. (2006) Biomaterials 27(13): 2747-2754. 56. Tremblay, P., Cloutier, R., Lamontagne, J., et al. Potential of skin fibroblasts for application to anterior cruciate ligament tissue engineering. (2011) Cell Transplantation 20(4): 535-542. 57. Van, Eijk, F., Saris, D.B., Riesle, J., et al. Tissue engineering of ligaments: A comparison of bone marrow stromal cells, anterior cruciate ligament, and skin fibroblasts as cell source. (2004) Tissue Engineering 10(5-6): 893-903. 58. Liu, H., Fan, H., Toh, S.L., et al. A comparison of rabbit mesenchymal stem cells and anterior cruciate ligament fibroblasts responses on combined silk scaffolds. (2008) Biomaterials 29(10): 1443-1453.